Oyama Lake is an 800-acre volcanic lake with great fishing and 27 islands to explore. 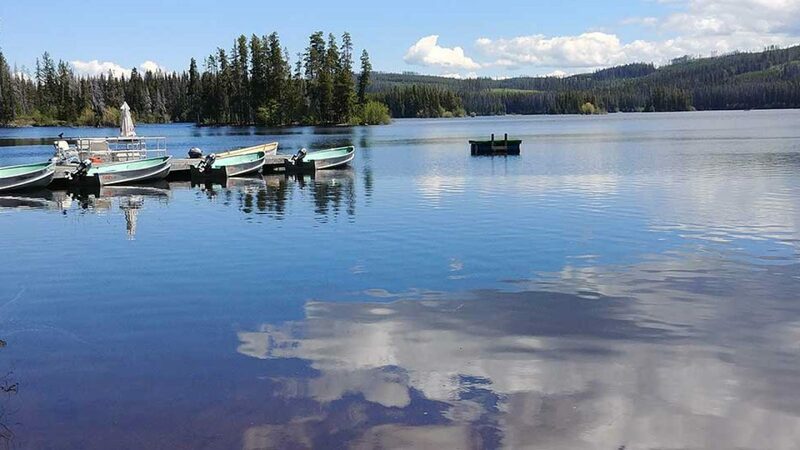 The deepest part of the lake reaches a depth of 87 feet making it a great place to find trout of varying sizes. It is also a great spot for swimming with the kids, however we do request that all little one’s wear life jackets. The popular “High Rim ” trail intersects Oyama Lake Road only meters behind the property in addition to many other hiking/biking/riding trails nearby and lots of untouched nature to explore. To find us you first need to find the town of Oyama, which is right in between Kelowna and Vernon. There is a logging road that takes you up the back hill towards the Oyama Zipline (Also really fun!). Keep going past the zipline and stay on the logging road for about 20 minutes. It is a dirt road that starts out nice and smooth but near the end it gets very bumpy. We recommend turning on your 4-wheel drive if you have it. If you don’t have it you can still get here if you drive nice and slow! We are a fishing resort with 15 cabins of varying size and style. We also have some camping spots and RV sites. Some of the cabins have all of the amenities including hot showers and some of them do not. For the cabins that do not have a private bathroom there is a shower house with on on-demand hot water system supplying limitless hot water. We also have a multitude of outhouses scattered throughout the property as well as a lady’s powder room that has a flush toilet. We have a boat launch that is free for those who are staying with us and $10 for outside guests. There is a children’s playground near the boat launch so we ask that anyone driving into the camp to please drive SLOW. Stocked every year with 15000-30000 trout there are lots to go around. There is a fish cleaning station on site as well as smoker. Most styles of fishing will see success, though anglers are required to use a single barbless hook system. We offer a wide variety of motorized and non motorized boats. Currently in our fleet of rentals we have: canoes, kayaks, paddle boards, Pedal boats, 3-man motor boats, 4-man motor boat, a 4-man pontoon boat as well as a 7 person pontoon boat. Drinking is not permitted while driving. There is an on-site store that is open from 8AM-8PM (8:30 AM on Sun) where you can buy basic supplies in case you forgot anything. We also sell firewood for outdoor fires for $15 per wheel barrel, farm fresh eggs from our coup, hand-made fly’s by a local artisan (Andy the fly guy), snacks, and bags of ice for $4. Henrietta and her gang are busy making eggs every night for you to enjoy for breakfast. Farm fresh eggs for sale in the store. You will need to bring your own drinking water and food (If you have chosen a cabin without a fridge make sure you bring a cooler). If there is something you think you need and can’t find in the cabin just stop by the store and we can help you out! Don’t bring any glass bottles. We have NO storage for them. Thanks for following our rules! Always ensure your pet is on a leash within the camp and please make sure to bring baggies to pick up after them. Pets are an additional $10 per day. Pets are not allowed on furniture so please bring a sheet to cover the couches and a doggie bed or kennel. Dogs are never to be left alone in the cabins or outside. Bring them fishing with you please as that way there is no chance they will cause damage to the cabins. Thanks in advance for abiding the rules! 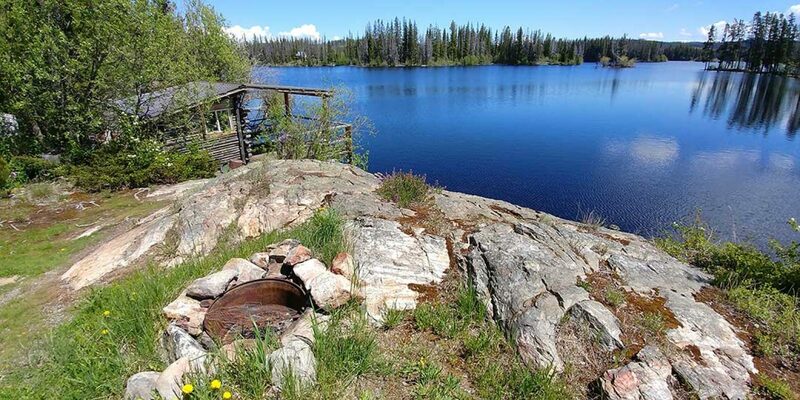 All cabins and campsites have their own private bon-fire pit (Some have bbq’s depending on the cabin). Please don’t bring in any outside wood. Also make sure your fire stays small and contained within the pit. Each site also has bucket beside it so that you can put it out with lake water after you are finished. Note: outside fires not permitted during provincial fire ban. Outdoor propane fire places available for rent during this period. There is a central area with a giant BBQ made out of an old boat. This area is for all guests to use; however, everyone must stop in to the store and get some brief instructions before operating the stove. It is a fun hang out spot! We have a variety of giant outdoor games (Jenga, Connect Four, Bocce, Dominoes and Yardzee) as well as a whole bunch of table top games that you are able to borrow from the office. Please sign them out first. Due to our very short season we have a very strict cancellation policy. We require 30 days advance notice to cancel your cabin. If it is already inside the 30 day mark then we will not charge you provided we are able to rent out the room to someone else. Thanks for understanding!